Don't miss the All District Band Concert at the RHS Performing Arts Center, beginning at 7 pm. Due to weather in the gorge, VRMS Team B's game with Canyon Creek has been cancelled. We will try to reschedule. Teams B and C will practice after school. Boys' Basketball Tryouts will begin January 2nd from 3:30 pm to 5:30 pm. In order to participate that day, you will need to be registered online and have a physical on file in the office BEFORE Winter Break. You can register online now. Please note that the Orange Team's game with King's Way on Monday, Dec. 3rd has been canceled. The Giving Trees have arrived! Trees are located in the entryway lobbies of both VRMS and Sunset. To support families in our area, just choose a tag, purchase the appropriate gift on listed on the tag, and bring it back, unwrapped, with the tag attached, to the main office by Dec. 14th. Thank you! On November 16th, you can join your SRIS/VRMS student for a turkey dinner in our cafe. The cost of an adult meal is $3.90. We look forward to seeing you there. Friday, November 2nd, is the last day of Penny Wars! 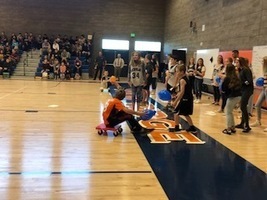 SRIS and VRMS classes have been competing in a Penny War. Pennies and bills count as positives and nickels and dimes are negatives.Friday is the final day. All proceeds will go to support teachers in their classrooms in the form of grants. You can schedule a conference with your student and their teachers on Skyward. Special times have been set aside on October 24th & 25th. Picture Retakes for students who missed picture day or would like to retake their photo will be on Monday, November 5th from 8 am until about 9 am. The View Ridge Cross Country Team will not be competing at the Lake Sacajawea Meet scheduled for Wednesday, September 19th. They will practice at View Ridge instead. View Ridge and Sunset Ridge took their picture packets home yesterday in preparation for Picture Day on Friday (Sept. 14). Principal Tony Smith shares important information for the upcoming school year. Read his welcome letter at https://tinyurl.com/y6vmptdd. For those who would like help registering for Athletics, have physicals they wish to turn in, or would like to pay fees, Athletic staff will be on hand to assist. 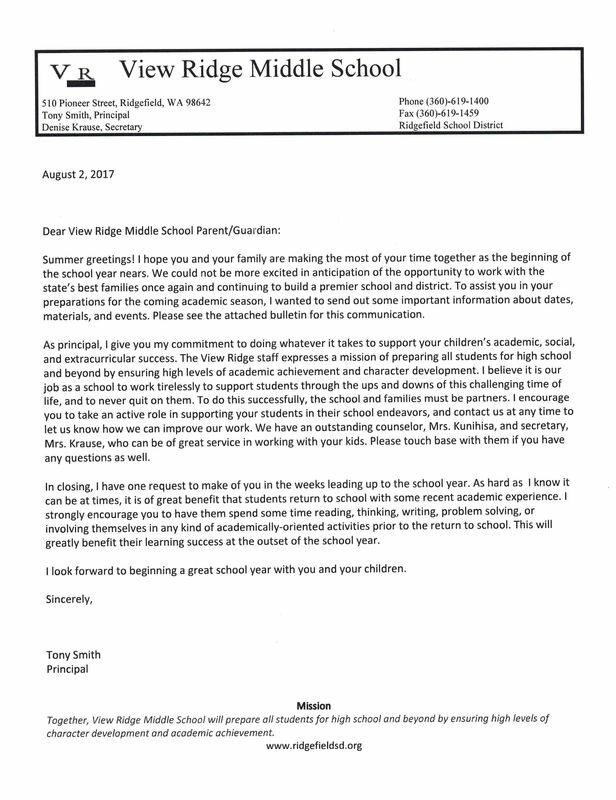 VRMS report cards were mailed out June 22. This Wednesday there is no late start. School begins at 7:55 Wednesday. No late start this week. Don't miss the final Choir Concert for this year! Thursday, May 31st, at 7 pm in the RHS Performing Arts Center. Cookie Dough Orders arrive this Tuesday, May 8th! Cookie Dough arrives Tuesday afternoon (May 8th). Unfortunately, VR has no way to refrigerate the cookie dough so please make arrangements to get your student's order home. If they have a large order, please plan to pick up your student and their order by 3 pm. Thank you for supporting VR students! VRMS Yearbooks available to order! Our View Ridge Yearbook is available to order now through May 18th! Orders must be made online at this website: viewridgebookstore.picaboo.comYou can choose hard or soft cover. Any orders placed after May 18th will not be delivered before the last day of school. Wednesday, April 25th at 8:00 am is the time to turn in all fundraiser items. Make sure your order forms and all monies are turned in by 8:00 in your first period class. Be certain that forms are legible, including names and first period teacher, and keep the pink copy so you know who to deliver the purchased items to. Your VRMS student's report card was mailed out today. View Ridge Middle School students will showcase their creativity in Art, Stem, Music, Drama, and French. Don't miss this opportunity to see what our students have been learning. Everyone is welcome to this free event from 5 pm to 6:30 pm on April 18th! VRMS students will be raising funds for new athletic uniforms, school events, and an end of the year celebration by selling cookie dough, sweet treats, and some other handy household items from April 11th to April 25th. Don't miss this delicious opportunity! Have a wonderful Spring Break and come back safely! See you Monday, April 9th! Do you have concerns for our students safety? Are you wondering about district emergency procedures? Join us on Wednesday, March 14th at the Ridgefield High School Commons from 5 pm until 7 pm. Monday, March 5th at 7:30 pm there will be an informational meeting for parents and students who are interested in RHS's AP curriculum and CAP. Help your 8th grader get ready for high school. Incoming Freshman Night will be this Monday, March 5th in the RHS Commons from 6 pm to 8 pm. There well be no school for students in Friday, March 9th, due to a Teachers' In Service Day. The Knowledge Bowl Meet originally scheduled for February 22nd has been rescheduled for March 22nd. 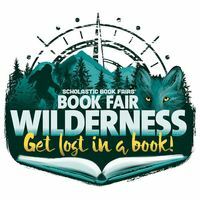 It will be at Hockinson Middle School with Wind River at 4 pm. March 6th at 7 pm marks our spring concert for View Ridge and RHS band students. Don't miss this opportunity to enjoy great music! March 8th at 7 pm, our View Ridge Students will join the high school for a concert at the RHS Auditorium. Come join us! Our last home game of the Boys' Basketball season will be Wednesday, February 14. Seventh and Eighth Team games will be at 4 pm and 5 pm respectively at View Ridge Gym against Castle Rock. The White Team will play Castle Rock at 4 pm at Union Ridge Gym at 4 pm, with the Orange team following at about 5 pm, playing Woodland. Hope to see you there! Track will begin Monday, March 26th after school in the VR Gym. Make sure you have a current physical turned in to the office and are registered online before March 23rd in order to practice. First meet will be home on Thursday, April, 19th. Our 8th Graders will be presenting their National History Day projects this Thursday, January 11th, from 5:30 until 7:00 pm in the View Ridge Gym. You won't want to miss this! The first meeting and practice for the 2018 Knowledge Bowl Team will be this Wednesday, January 10th, in Mrs. McCann's room, after school. This is a great opportunity to "show what you know". Hope to see you there! As we come back from Winter Break, Boys' Basketball has begun! The first game of the season will be Wednesday, January 17th at Canyon Creek, Washougal. Don't miss the last game of the VRMS Girls' Basketball season tonight beginning at 4 pm against Hockinson! Saturday Woodland will host the Middle Schools Varsity Wrestling Tournament at Woodland High School. VRMS JV Wrestling Tournament Today! The JV Wrestling Tournament scheduled for Saturday will be held today at Woodland Middle School at 4 pm. Ring in the holiday season with the VRMS Band Concert at RHS Auditorium on Thursday, December 7th at 7 pm. Join us for the final Girls' Basketball Game here at View Ridge Middle School beginning at 4 pm, on December 11th. December 21 - January 3 is our Winter Holiday Break. Have a safe holiday season and we will see you on January 4th! Change in Date for Girls' Basketball (Orange, 7th, and 8th). The Girls' Basketball Games at Castle Rock, scheduled for Dec. 4th, have been changed to Tues. Dec. 5th. Thanksgiving break is November 22nd through November 24th. Have a great and safe break! See you Monday, November 27! Report Cards will be mailed home on Wednesday, November 15th. If you would like more information regarding Grading at View Ridge, you are invited to a meeting on Thursday, November 16th from 7 - 8 pm in the View Ridge Library. 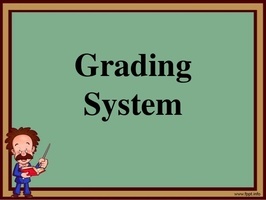 Join us for a meeting regarding Standards Based Grading for 7th and 8th Grades at the View Ridge Library this evening at 7:00 pm. It's time to register your student for Girls' Basketball or Wrestling! First practices will be on October 23rd after school. Even if they have already played a sport, they will need to update their registration. See our Athletics page. VRMS Football Game on Sept. 14th cancelled. Please note that Woodland has cancelled our Football game with them scheduled for this Thursday. We hope to reschedule it soon. VRMS will have picture retakes on Wednesday, September 27th from 9 am to approx. 9:30. First practice for Girls' Soccer will be Tuesday, August 29th at RHS's Lower Field at 3:00 pm. You will be able to ride a bus from VR to RHS. First practice (try-out) will be Monday, August 28th at VR Gym at 12:00 noon. The first meeting for VR Football will be Equipment Checkout on Friday, August 25th at VR at 3:00 pm.First practice will be Monday, August 28th at VR at 1:00 pm. First Practice for VR Cross Country will be Monday, August 21st at VR at 3:00 pm. Please notice this time change, we want you to enjoy the eclipse with your family. Monday, August 14th, 2017, from 4:30 pm to 6:30 pm, in the Ridgefield High School Library, we will be available to help register for athletics, accept Physicals and Medical Forms, as well as answer questions. Feel free to stop by. The 2016-2017 school year is complete! Thank you for all you've done to make the year a successful one. Watch View Ridge's website for information and events that will help you and your child prepare for the new school year beginning in August! See you then. We are excited to begin our Girls' Soccer Program at View Ridge this fall. There will be an informational meeting for Parents and Players on May 22nd at 6:30 pm at RHS. Smarter Balanced Testing begins on Tuesday, May 16th. Get a good night's sleep and eat a good breakfast. We are excited to announce a Fall Girls' Soccer Program for 2017-2018 at View Ridge! More information coming soon. View Ridge students are competing between first period classes to see who brings in the most school supplies for the RFRC. Supplies needed include pencils, pens, spiral notebooks, binders, crayons, colored pencils, scissors, glue, and other supplies. This is a great way to help families in our area! Go Rebels! April 3rd - 7th is our district's Spring Break. Have a safe and relaxing time. See you back on Monday, April 10th! VR Book Fair has begun! Students must be registered by 2:30 pm this Friday in order to be able to participate in the first practice on Monday. Monday track athletes will meet in the View Ridge Gym. Tuesday and Wednesday will be at RHS stadium. Join us for our 7th Grader's presentations of their Eco System projects between 6 and 7 pm Tuesday, March 21st in the View Ridge Gym. It is time to order your View Ridge Rebel Yearbook online! Check out the page on our website either under "For Students" or "For Parents". You won't want to miss it! RHS is offering a free 2-hour Practice SAT/ACT exam on Friday, March 10th, from 9 - 11 am. You must register before Tues. February 28th to participate. Please see Mrs. Kunihisa if you are interested. Track will begin March 27th (not April 10th as previously announced). Registration must be in, including a current physical by Friday, March 24th to ensure eligibility for the first practice. Tuesday, January 10th, from 6:00 pm to 8:00 pm, View Ridge will host a Special Education Parent Night. Light snacks will be provided and limited child care (RSVP required for child care). Do you ever wonder what your student does all day at school?Wednesday, January 18, is your chance to experience what it is like to be a student at View Ridge Middle School.Contact View Ridge Office for more information at 360-619-1400. Tomorrow, Wednesday, December 14th, is the last day for our Canned Food Drive. Who will win? The seventh grade or eighth grade? It's not too late to help your team! Today begins the View Ridge Canned Food Drive. The seventh and eighth graders will be competing to see who brings in the most canned goods by Wednesday, December 14th. The donations will be used to help our community during the holidays. Our "Lost and Found" is overflowing! Please check in the commons if you are missing items. We have many water bottles, lunch bags, notebooks, books, sweatshirts, jackets, shoes, and much more! We will be donating items that are left in the lost & found during Thanksgiving Break. Friday, Nov. 4th at 2:30 pm, the cookie dough and other food stuffs will be here for pickup and delivery. If your student has very many pieces in their order, please make plans to pick up your student and their order. On Tuesday, Nov. 1st, View Ridge's 8th graders will go to RHS to learn about a variety of universities, colleges, technical schools, apprenticeships, military and community service options. October 27th and 28th View Ridge will have Early Release at 11:30. Students have the opportunity to buy a "grab-n-go" sack lunch before they leave if they choose. October 26th and 27th will be View Ridge's Parent - Teacher conferences. Wednesday, October 26th will be from 5 pm to 7 pm. Thursday, October 27th will be from noon until 3:00 pm. You are invited to meet with your student's teachers at these times. Monday, October 24th, is the first day of practice for our Wrestling Team and Girls' Basketball Teams after school. Students must be registered with current physical (24 months) on file in the office. Wrestlers also need to have a weight permit from their physician turned in.